First Jump Lesson with New Trainer! 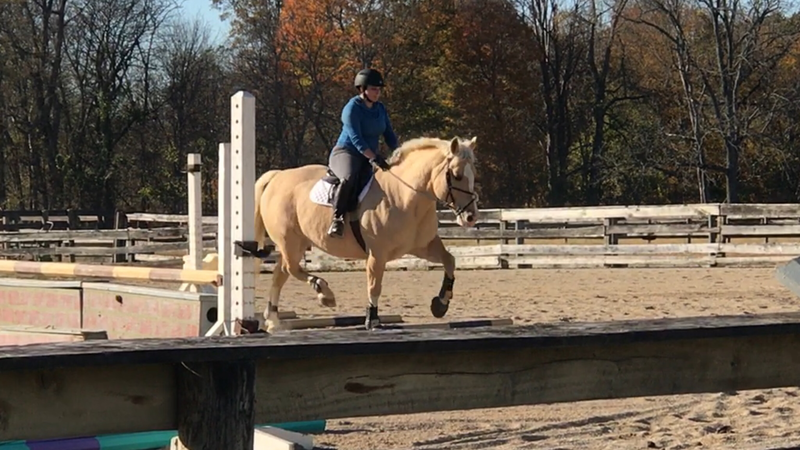 I blanked… I admitted we hadn’t really been jumping and then said, “between Starter and BN is pretty comfortable.” Spoiler alert, turns out it wasn’t super comfortable (but everything was a hole or two smaller than the pics). The jumps were laid out in a way that gave a lot of options, gymnastics, and related distances. Overall, everything was set up to be super technical. I warmed up, and she had me head through the gymnastic towards home, trotting in and cantering through. It was originally set really small, with just one side of each pole in the cups, and the distances were a true one stride. NT explained to me that the ring has a bit of a slant towards the barn, so things will always ride more forward coming towards the barn (i.e. traveling left to right of the above photo). May was a bit wiggly the first time, and I don’t blame her. We haven’t done a gymnastic like this in a LONG time (like more than 2 years), and she wasn’t totally schooled in them at that time either. However, I kept my legs on, my reins open, and we were just fine. We alternated our approach to it a couple of times (making a right turn into the gymnastic, a left turn at the end, then a left turn into the gymnastic and a right turn at the end), until it was smooth and easy. Then, she put them up to small verticals (about a hole smaller than the above pic). After that, it was time for our first course. Down the gymnastic (left to right), right turn and up the green line in 4, left turn and down the barrels. Sounded easy enough. Except I also cannot remember the last time I did a line that was oxer to vertical… That line was set to about 2’6″, and the approach to it was a bit weird. 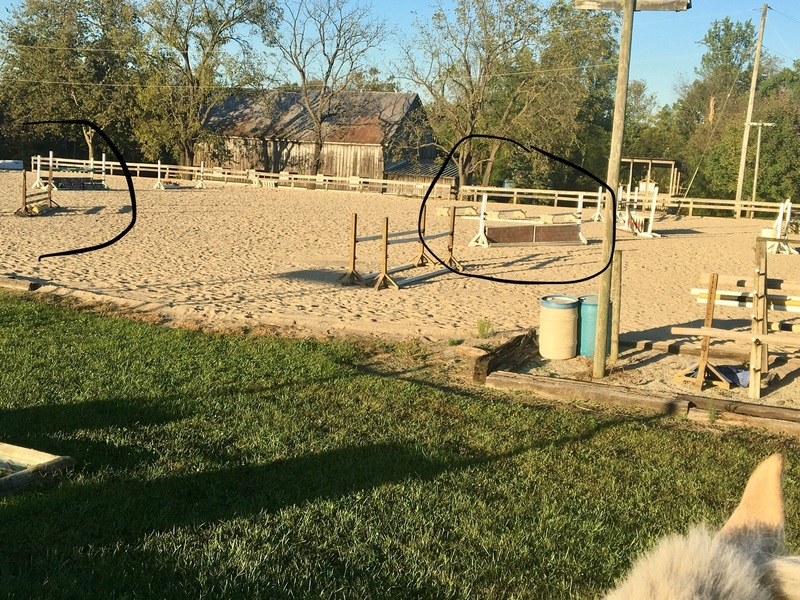 I tried to capture it in the below photo, but you had to come maybe 2 strides past the corner of the ring, turn, and then had maybe 2 – 3 strides off the rail to the oxer. AND THEN we would have to turn right and come down the double barrels that I wasn’t too sure about. The “Green” line (oxer to vertical). We did that course one more time and while the turn to the oxer wasn’t perfect: I didn’t throw my body at it or panic. I just added leg and tried to keep my body back. Overall, a lot of improvement. Now for a new course! Down the gymnastic, a right turn to the purple line (so oxer to vertical), and then around to the barrels. Gymnastic was great. I got to the oxer into the purple line, and we lost our balance a bit. I over corrected coming down the line, and got to the out in 5 and 1/4 strides… and promptly threw my body up May’s neck. Uh… not helpful. We rubbed it hard and landed in a heap on the other side. The “Purple Line” is the red white and blue, square oxer to the purple jump. You can also see the turn from the gymnastic to the oxer, and the turn off the corner to the “green” line. “KICK AND SIT UP!” I heard from the other end of the ring…. oh gosh. our first lesson and here she is terrified that I am about to eat dirt. Oh well, I kicked on. Got a brief instruction of “always kick away from something like that!” while I cantered past her, and back to the barrels, which were, once again, no problemI walked, and huffed, and puffed (it was like 85 degrees with 80% humidity). May was prancing around like she was ready to go run the Belmont. Trainer sent me back to do just the barrels to the purple line again. It got tight on me again, but I sat back and it rode fine. SHOCKING. Finally, it was time for our last course. Is your head spinning? Mine was. UP the gymnastic, a left 90* turn to the purple oxer, a right turn down the blue line, a right turn to the barrels, and then ANOTHER right turn to the green line. The turn from barrels to the green oxer wasn’t quite as tight as it looks in the pic, but it wasn’t much more generous. I jumped up the gymnastic and actually had too tight of a turn to the oxer… and promptly forgot to turn right. I looped back around, got my right lead, and came down the blue line. Despite being a true 2 strides to 2 strides, the second half got a bit tight (*more of this later). The barrels, as always, rode great, but we landed on the left lead. I tried to fix it. I failed. I lost her shoulder and AGAIN the green line was ugly. At this point, I actually felt nauseous from the heat. (May was fine though. Totally amped and ready to keep going). I jumped the barrels, we again landed on the left lead, I left the lead… and couldn’t turn to save my life. I ended up pulling her around the corner at the last minute and almost missed the jump. I did get a nice 5 in the line though. I was officially done tho. We identified something to work on, and it was overall really positive. NT really liked May. She was shocked by how easily she got down the line, how un-bothered she was by all my mistakes (my words, not hers), and how light she actually is on her feet. She seemed really excited to be working with us, and I felt like I got a lesson that really challenged me without over-facing us. The whole idea is to do really technical courses at home, so, at shows, things feel easy. Sounds good to me! *Now the striding thing. Since May had her hocks and stifles done, her stride opens up MUCH easier, and I am still getting used to riding the difference. She is also more receptive to taking the long spot, vs. chipping in, so it has really affected my riding. After Dressage, I had nearly 2 hours until Show Jumping. I took a look at both the show jumping and cross country course, but I wasn’t able to fully walk either due to the late start we had in the morning. Oh well, show jumping was 8 jumps with 1 related distance, and XC was basically one big loop. May got to hang out in the shade and enjoy the breeze and grass, while I got to actually eat some real food. It might have been 10:30 in the morning, but I needed lunch! Once we were about a half hour to my SJ time, I pulled May off the trailer, threw on our jumping stuff, and got back on. Given that XC was running immediately after SJ, I just put all of May’s XC gear on and wore my vest. And then promptly forgot my armband. Whomp Whomp. Entering the ring for the round was a bit awkward, as you had to check in with the volunteer at the in gate, and then trot to the other end of the SJ field to check in with the judge. I also wanted to trot by 7 because, for BN, there was a 7B. As a result, right after 7 there were a bunch of poles in the grass, and I wanted to make sure May saw them before we were at the base of 7. So once we checked in with the judge, I trotted along past 5, since that was a couple of hay bales and sometimes hay bales are scary. I picked up my canter, and May immediately started throwing her head around. Ugh. I got her attention back somewhere around 4, as I made my turn to jump 1. Unfortunately, our lack of focus meant my line wasn’t as crisp as I wanted, as May drifted behind my leg and towards the in gate. What does this all mean? It means we pretty much clobbered jump 1. I think this is between Jump 7 and Jump 8. I kicked forward and got a slightly better rhythm and line to jump 2. We jumped in a touch weak, so I decided to balance up and do the add. Except I HADN’T WALKED the line. SO I got 3/4 of the way down the line, and I realized it was SET SHORT. It was also too late to chase her for what would have been a MASSIVE distance, or just faster shuffling corgi steps toward the nothing distance we already had lined up. Oops… we got to the oxer with no step, no impulsion, and no distance. Cool. May HEFTED herself over it, somehow leaving it up. Seriously, there is video evidence of this that I need to upload for you all. I think it went fine though. 😉 It ended up probably being our nicest jump on course. Jump 6 I don’t even remember jumping. I probably stopped breathing that point. At 7, I was determined not to have the same issue I had at 1, and I rode more determined through my line. As a result, 7 was a non issue. I turned to 8. Kicked on, and was over. So SJ finished with just one jump down, but I was pretty frustrated for myself for not starting the round well. Jump 8. May thinks the jumps are way too small. SJ was pretty messy for a lot of people, and I later heard that the first jump when down a lot for people. Overall, we moved from 4th to 6th out of 19. No matter the score though, I was determined to go out and attack XC. Of note, all the professional photos were purchased by me from Bluegrass Equine Photography for digital use. I am a big believer in supporting horse show photographers, so I was more than happy to pay for these happy memories! Obviously, I answered with an enthusiastic, “Yes!” (followed by about a million smiley faced). Then, I sort of panicked. See, May and I have only kind of loped around fences super casually, and I didn’t get the weekend at all to prepare. Saturday we did some long and stretchy stuff, and Sunday we did some walking. My “crop circles” from Saturday. Three 20M circles connecting. Love using this to get stretchyness and relaxation. I got on about 20 minutes before my lesson to let us warm up before the lesson started. 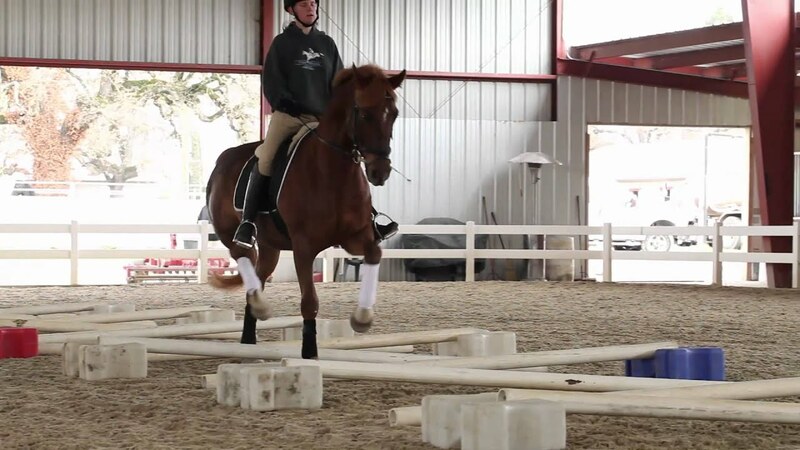 Unlike trainers of my past, my current trainer likes to get right into jumping or Dressage or whatever it is we are working on that day, so it is best to be warmed up before we get started (unless we are working on building or fixing a specific warm up routine for whatever reason). While I was warming up, another lesson was going on. This woman at my barn competes Saddlebreds in the breed competitions, but she has fallen in love in eventing and is retraining her REALLY successful Saddlebred mare to be an eventer. I think this was one of their first jumping lessons, and let me tell you, that girl has hops! My trainer was laughing about the variety of horses in her barn, going from training a Saddlebred to my little draft cross mare. It makes it fun and interesting, and it shows just how many tools she has in her tool kit. Onto my actual lesson! Below was the general set up of the arena. There were two outside lines that aren’t shown on the below, but we didn’t jump them, so I didn’t include them. I think it’s busy enough as is! So where did we start? Well, we started with my trainer explaining that this would be a gymnastic-type lesson to see where we’re at. Works for me! We started with trotting that single orange pole at the top. Literally. One pole on the ground, at the trot. My trainer had me establish rhythm and had me focus on NOT pushing May past her rhythm, which was actually a lot more difficult than I thought it would be. We ended up having to do this twice, each direction, to get it right. Then, we moved to the set of three, teal, poles next to it. Each of these were raised on one side in an alternating fashion. Again, the focus was keeping the rhythm even and a little slow. To get the power and push from behind without the horse trying to run through the exercise. Thanks to the first exercise, this one was pretty easy. We got it quickly, and were able to move on. We moved onto the “Circle of Love”, which is the circle of blue jumps and blue cones in the above diagram. (my trainer REFUSES to call it the Circle of Death). Either way, it was a 20M circle with 4 jumps, and 4 sets of cones. At first, she only had 2 of the jumps up, but we were able to do that with absolutely no problem, so she made it up to all 4 jumps after 1 circle. Moral of this story? I do not need to throw my body over fences, and I need to be more comfortable with correcting quickly after a fence. I would say the first time through in each direction was rough, but once I got over the idea of letting May lift me out of the tack instead of throwing my body around, it got a lot easier. My trainer explained that the goal of an exercise like that would be to first be able to get through the exercise comfortable in both direction. Then, to get the same number of strides between each fence. Once that is established, then you can make it more difficult by going outside the cones and adding 1 additional stride between each fine, and then weaving inside the cones and getting 1 fewer stride between each fence. She said this is something you would build over time, and wasn’t something we should try to drill into the horse in a single session. Next was an exercise in adjust-ability. We moved onto the three purple poles in a straight line down the middle of the arena. Not sure if any of you remember an earlier post, but I had jumped through these in a super open 3 to try and jump from a more open stride. Yeah… not the focus of this lesson. I was told to jump in and just let it happen in 4. We did that once in each direction, and then my trainer told me to do each of them in 5. Now, May now knew that these were a 4, and turning an open 3 into a 5 is a pretty big ask from the big lady. The first time in, she blew off my half halt before the first fence, blew it off between the first and second fence, and my trainer told me to halt before the last fence. We did, and then we tried again. It continued to be REALLY difficult for her, and there was a told of dramatic head throwing. However, she was completely capable of doing it. For my part, I had to think of getting a real Dressage-Like canter. I mean, I was visualizing the canter I need to get a solid leg yield across a diagonal type of Dressage canter. I needed to keep May really high through the poll and shoulders. I don’t think I have ever asked this horse to collect her canter this much, and you know what, I should be. A couple of times, we close momentum and ended up in the trot, but I just circled and asked again. If she went through the jumps correctly, she got to canter on a more forward stride and looser rein as a reward. So how do you build on that? You jump a very technical course with very low jumps! We were instruction to come down the purple line of jumps in a 5 to a 4, go around the 9 o’clock jump on the circle of love, go between the cones, jump the 6 o’clock jump on the circle of love, go through the next set of cones. Then, we had to complete the S patter, by jumping the gray diagonal jump, turn to jump the last 2 jumps of the purple pattern in a 4, and then make a right turn to jump the oxer. After the oxer, we had to keep our line to fit through the super tight opening between the middle purple jump and the teal, raise poles. So how did it go? Well, the first time, I wasn’t able to get the 5 to the 4. I didn’t push May forward over the second jump, and we just didn’t have the power to get 4, so we started again, and we nailed it. I came around to jump 4, which she jumped a bit big, which left us big to jump 5… and then I promptly forgot where I was going. My trainer told me, “I knew you forgot because you were looking at the wrong end of the arena.” whoops! You can see the narrow path we had to take here. We restarted at jump 4, since May seemed to really understand the purple exercise. I rocked her back for jump 4, kept the bouncy canter for jump 5, demolished jump 6, cross cantered to jump 7, got my balance back around the corner, and jumped 8 beautifully before easily keeping our line through the small opening before ending our course. Was it pretty? Nope. That’s why you do these types of things with small jumps. We decided to end on that note. Sure, the 4,5,6,7 line could’ve been cleaned up a bit, but we kept our rhythm and our line, which was the whole point. Since she jumped 8 so well, we through that was a great note to end on. Another pic of that square oxer at the end. The purple and teal jumps in this photo are the purple jumps from my diagram. The circle of love was the same height. I was scrolling back through my posts to see if I could confirm this, but I am pretty sure Sunday was the first day I did an actual course of jumps in my new jumping saddle… I have popped over a few single fences here and there, but hadn’t actually strung a course together… nor do I think I had jumped an oxer in that saddle… and I know I wasn’t jumping oxers in my Dressage saddle… so how long had it been since we had jumped an oxer… Oops. Oh well. Hindsight? I should’ve brought my crop with me. The horse with the carriage was out there when I went to get on, so I got on in the indoor and then walked over to the outdoor. No reason to get dumped because I didn’t want to bother to walk an extra 50 feet to a less busy arena. May didn’t seem to have a problem with the carriage this time, which was definitely improvement, but she was definitely just preoccupied with thoughts of what the cart was doing. I couldn’t really get her totally in front of my leg, but she was relaxed and obedient. Since the jumps were set pretty small, I figured I would just warm up a bit and hope she woke up a bit. (This is terrible horsemanship, but… oh well… I had a relaxed horse.) There was a small box (maybe 12″) set up so that you could canter a 20 meter circle over it, so I started with that. I worked on establishing rhythm without losing suppleness through her body. It is probably also worth noting that I was testing a different bit in this video. A Myler D ring with hooks. No chain, but hooks. Jury is still out on it, but I clearly don’t need the pelham if she keeps going like this! So how do I feel about my jumping saddle around a course and over an oxer? I am pretty damn happy with it still. It doesn’t rock over fences like other saddles I tried. May clearly seems relaxed and happy giving me the long spot in it, and I felt my position was fairly solid given how long it has actually been. WHEW! Just happy to be doing more than fancy prancing and trot sets though! Also – who is going to the event-formerly-known-as-Rolex, aka KY3DE, aka Land Rover 3 Day… AKA who knows what they’re calling it now? I will be there for XC with the husband! Amidst all the driving back and forth to the barn, I have had an opportunity to reflect on what I am more thankful for in my riding career. However, the thing I am most thankful for, is the mare that turned out to be much more than she was ever supposed to be. I have talked a lot in the past about how May was a complete impulse buy. You can read the full story here: A May As Well Purchase However, I am not really sure I ever explained what I was expecting. Originally, when I bought her home, we joked that I had overpaid for her. After all, she couldn’t even do a 20M circle before she popped her shoulder and ran in the opposite direction, a canter took nearly 20 steps of trot to pick up, and I quickly learned that she had never seen a gymnastic. To be honest, my original thought for buying her was that, if she didn’t work out, I could recoup most of my money and just sell her as a trail horse. She was sane, and sensible, and had color. All the things trail people want. Right? I mean, she could comfortable carry a larger rider for miles without discomfort. Then, we went to our first CT. It was a W/T Dressage Test and 18″ stadium round. I think she has turned out to be really cool… And I can’t wait to see what more she has to show me.